You can use any stroke you want in the swim portion. The word "triathlon" can make even the most avid exerciser take pause, unless you're a world-class endurance athlete. The marathon swimming, biking and running event seems near-impossible for most mortals. However, a sprint or mini-triathlon is well within the capabilities of many women. Training for the event will get you in tip-top shape, and when you cross the finish line, you'll feel a tremendous sense of accomplishment. There are some triathlons that are best for beginner women athletes. Take the plunge -- you just might find it to be a life-changing event. There are four basic types of triathlons. The famed Ironman triathlon consists of a 2.4-mile swim, a 112-mile bike ride and a 26.2-mile run. The Half Ironman cuts all three distances in half. In an Olympic or international triathlon, you'll swim 0.9-miles, cycle 24.9-miles and and run 6.2-miles. A sprint or mini-triathlon varies in distance. 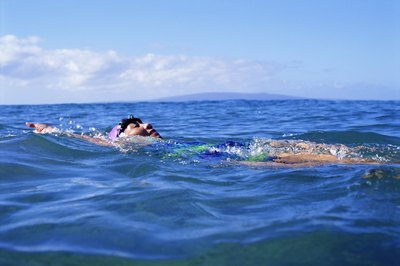 Swims usually are 400 to 825 yards, bike legs are about 10 to 12 miles and runs are about 3 miles. The shorter distances make the sprint triathlon one of the best for beginners. As you build endurance, you can graduate to tougher triathlons. 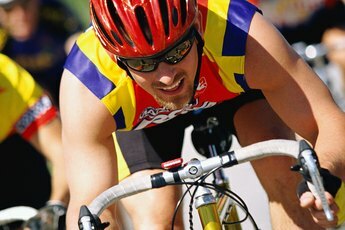 BeginnningTriathlete.com recommends a 13-week training program for a sprint triathlon. However, you need to be in moderately good shape before you begin the program. If you can swim for 20 minutes without stopping, ride a bike for 30 minutes and run for 20 minutes -- on separate days and at a leisurely pace -- you're ready for the program. It consists of a day-by-day routine that eventually builds your endurance to a point where you are able to swim for 35 minutes, ride for 60 minutes and run for 45 minutes. Be sure to consult with your doctor before starting such a program. In addition to the physical demands, a sprint triathlon requires you to assemble an extensive array of gear. You'll need a swim suit, fins, goggles and a cap for the swim phase, a bike, helmet, cycling shoes, padded gloves, clipless pedals and a water bottle container for the bike leg, and running shoes, triathlon wear to keep you cool or warm in varied weather conditions and the ubiquitous water bottle. However, you don't need to max out you credit cards. According to the Triathlete Woman website, a "half-decent" bike will suffice. Sprint triathlons for women contestants are popular. 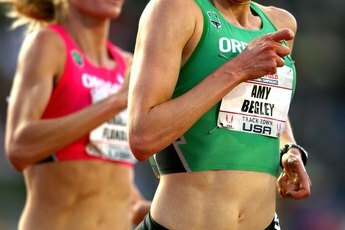 The atmosphere at women-only sprints tend to be less physically intense and more congenial in atmosphere. San Diego coach Neily Mathias-Clode told the IDEA Health & Fitness Association website, "There is something more sisterly and supportive about training and running with women." You can find a list of co-ed and women-only sprint triathlons in every state in the union at TriFind.com. Can You Train on an Elliptical Machine for a Half Marathon?